You'll Love Cambodian Food - But Get to Know it First! Although Cambodia is still crawling through a recovery due to its brutal past, millions of tourists flock to Siem Reap annually to explore the temples of Angkor Wat. A majority of those tourists come from neighboring Thailand, Laos, or Vietnam without knowing what to expect from Khmer food. "Cambodia's food is often all about the contrasts—sweet and bitter, salty and sour, fresh and cooked," explains Serious Eats' Jennifer Kikoler. "[Cambodia] shares many dishes with its neighbors, and you'll find noodle soup similar to Vietnamese phở and sandwiches like bánh mì, Thailand's refreshing salads and sour soups, Indian-inspired curries, and noodles and stir fries handed down from years of Chinese migration." Commonalities with neighbors aside, Cambodia's resourceful people have found their own ways to add a tasty, unique twist to otherwise familiar dishes. 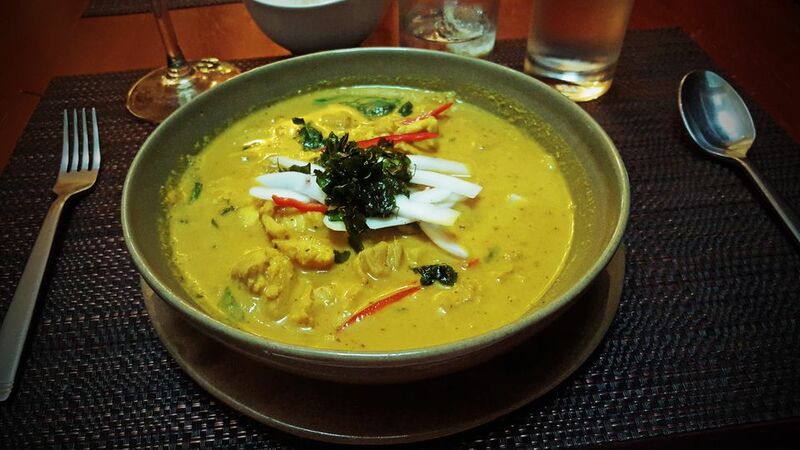 Curries are a common staple of Khmer food, although they are typically less spicy than those found in Thailand. Khmer food tends to contain a larger variety of stir-fried vegetables and more garlic than found in Thai food. The large volume of freshwater rivers and streams flowing through Cambodia make fish the most important protein in Khmer food. Adventurous eaters know that traditional Khmer food shares a common, unfamiliar flavor across many dishes. The secret ingredient is prahok - a salty, pungent paste made from fermented fish. While prahok is sometimes served in banana leaves and eaten on its own, more commonly the tangy, fishy substance is used to add a kick to other dishes. New to Western palettes, potent prahok can take some getting used to. Even meats and vegetarian dishes are frequently given a fishy flavor by adding generous doses of prahok or kapi - a similar fermented paste made from shrimp. If the flavor becomes too much for you, stick to eating noodle dishes which, by default, never contain prahok. Fish isn't always the predominate flavor found in Khmer food. A large variety of spices, many commons in Indonesian food, turn up in Cambodian stews and curries. Cloves, cinnamon, nutmeg, turmeric, and star anise lend a hint of Indian influence. Kroueng - a combination of chili, native, and imported spices - is prepared ahead of time as a paste and added to Cambodian dishes for an instant zing. Amok: Amok is a curry commonly made from fish (trei or trey), but varieties can be found with chicken (moan), and other meats. The meat is cooked in banana leaves, sweetened with coconut milk, and seasoned with kroueng spices. Amok is usually served with rice. Bai Cha: Bai Cha is Cambodia's hearty take on fried rice. Chinese sausage and soy sauce make bai cha heavier and darker than other variants of fried rice. Samlor Machu Trey: Sweet and sour fish soup is commonly eaten as a main or used as a starter for bigger meals. Pineapple adds the sweetness; chili garlic and lemongrass give the soup a nice kick. Ka Tieu: Ka tieu is a light noodle soup made from pork broth. Garnished with green onions, cilantro, and bean sprouts, ka tieu is similar to Vietnamese pho. Khmer Laksa: The Khmer take on laksa - a popular food in Penang - is slightly different. Thin rice noodles are added to a red curry soup with vegetables and fish sauce. Read more about laksa. Babar: Similar to bubur found in Malaysia, babar is a starchy rice porridge with chunks of chicken or pork; bean sprouts and onions are added for texture. Dessert in Cambodia is commonly simple fare such as sticky rice or just fresh fruit. Mango, coconut milk, banana, and other ingredients are sometimes used to make puddings, tarts, or sticky rice - the sweeter the better. As with the rest of Southeast Asia, the durian fruit still reigns supreme! The Khmer people remain welcoming despite their turbulent past. Getting invited to someone's home is the ultimate way to experience authentic Khmer food. Do not decline an offer - and an extraordinary opportunity - to experience real Cambodian hospitality. Go prepared, read about etiquette in Cambodia. Remnants of the French colonial days, hard baguettes are still found throughout Cambodia. Baguettes are often used to make pâté or vegetable sandwiches for breakfast. Strong coffee compliments the typical breakfast, but expect a liberal dose of cream and sugar to be added unless you specify otherwise. Even escargot can be found in some restaurants.